Speaking at the conclusion of the third round of nuclear talks in Vienna between Iran and the 5+1 Powers on Wednesday, Iranian Foreign Minister Mohammad Javad Zarif said that “sufficient and serious resolve” is needed for a final deal. The Islamic Republic and the 5+1 (US, Britain, France, Germany, China, and Russia) agreed to resume discussions on May 13 in Vienna. We have now reached the halfway point of negotiations on the comprehensive agreement. Over the past three months, the entire issues considered by both sides were taken into account. For the next round of talks the parties will first agree upon a specific framework, and afterwards details will be brought into the framework to pave the way for the final accord. The European Union’s Catherine Ashton, the lead negotiator for the 5+1 Powers, said the two sides must carry out “a lot of intensive work” to bridge differences. 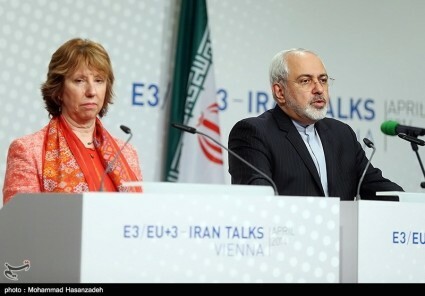 Issues in the three-day discussions included the number of centrifuges for Iran’s enrichment of uranium to 5%, the status of facilities like the Arak heavy-water reactor and the Fordoo enrichment plant, and the lifting of US-led sanctions. Oil Minister Bijan Zanganeh has warned that there will be significant rises in basic goods and services with the second phase of subsidies reform. The Rouhani Government has said that substantial changes are needed in the subsidy cuts program, introduced by President Ahmadinejad in December 2010, as its costs are far greater than revenues. The Government has indicated that support payments to cover price rises will be limited to the less well-off. Speaking after the nuclear talks in Vienna on Wednesday, Foreign Minister Mohammed Javad Zarif criticized US objections to Iran’s proposed Ambassador to the United Nations, Hamid Aboutalebi. Critics of the appointment claim that Aboutalebi was one of the students who took over the US Embassy in 1979 and held 52 hostages for 444 days. Aboutalebi and students involved in the occupation say he was only brought in occasionally as a translator. We have told the Americans that we have introduced one of the most experienced, logical, and ambassadorial individuals who has Embassy experience in several countries, including Italy, Belgium and Australia…. Extremist groups should not be in the position to determine who Iran chooses for the United Nations. Head of judiciary Sadegh Larijani is the latest high-level official to denounce the European Parliament’s resolution expressing grave concern over human rights in Iran. Larijani said Thursday’s resolution, reviewing European relations with Iran, is “blatant meddling” in the Islamic Republic’s internal affairs. The judiciary head specifically referred to claims of intimidation and imprisonment of members of the Baha’i faith. He said that the Baha’i were “Westerners’ fictitious religion to disrupt Islamic countries” and that Iran’s “judicial confrontations” with its followers were aimed at “those who spied for the foreigners or acted against national security”.